The Federal Emergency Management Agency (FEMA) hereby gives notice to the public of its intent to reimburse eligible applicants for eligible costs to repair and/or replace facilities damaged by Tropical Storm Michael (FEMA-4411-DR-VA) occurring from October 09, 2018- October 16, 2018. This notice applies to the Public Assistance (PA), implemented under the authority of the Robert T. Stafford Disaster Relief and Emergency Assistance Act, 42 U.S.C. §§ 5121-5206. Under a major disaster declaration (FEMA-4411-DR-VA) signed by the President on 12/18/2018. The following counties are eligible for PA only: Amelia, Appomattox, Brunswick, Campbell, Charlotte, Chesterfield, Cumberland, Dinwiddie, Essex, Floyd, Fluvanna, Franklin, Grayson, Lancaster, Halifax, James City, King and Queen, King William, Lunenburg, Mecklenburg. Middlesex, Montgomery, New Kent, Northampton, Northumberland, Nottoway, Pittsylvania, Powhatan, Prince Edward, Rappahannock, Richmond, Roanoke, Westmoreland and the independent cities of Danville, Galax and Martinsville. Additional counties may be designated at a later date. All counties in the Commonwealth/State of Virginia are eligible for HMGP. This public notice concerns activities that may affect historic properties, activities that are located in or affect wetland areas or the 100-year floodplain, and critical actions within the 500-year floodplain. Such activities may adversely affect the historic property, floodplain or wetland, or may result in continuing vulnerability to flood damage. Presidential Executive Orders 11988 and 11990 require that all federal actions in or affecting the floodplain or wetlands be reviewed for opportunities to relocate, and evaluated for social, economic, historical, environmental, legal and safety considerations. Where there is no opportunity to relocate, FEMA is required to undertake a detailed review to determine what measures can be taken to minimize future damages. The public is invited to participate in the process of identifying alternatives and analyzing their impacts. FEMA has determined that for certain types of facilities there are normally no alternatives to restoration in the floodplain/wetland. These are facilities that meet all of the following criteria: 1) FEMA’s estimate of the cost of repairs is less than 50% of the cost to replace the entire facility, and is less than $100,000; 2) the facility is not located in a floodway; 3) the facility has not sustained major structural damage in a previous Presidentially declared flooding disaster or emergency; and 4) the facility is not critical (e.g., the facility is not a hospital, generating plant, emergency operations center, or a facility that contains dangerous materials). FEMA intends to provide assistance for the restoration of these facilities to their pre-disaster condition, except that certain measures to mitigate the effects of future flooding or other hazards may be included in the work. For example, a bridge or culvert restoration may include a larger waterway opening to decrease the risk of future washouts. For routine activities, this will be the only public notice provided. Other activities and those involving facilities that do not meet the four criteria are required to undergo more detailed review, including study of alternate locations. Subsequent public notices regarding such projects will be published if necessary, as more specific information becomes available. In many cases, an applicant may have started facility restoration before federal involvement. Even if the facility must undergo detailed review and analysis of alternate locations, FEMA will fund eligible restoration at the original location if the facility is functionally dependent on its floodplain location (e.g., bridges and flood control facilities), or the project facilitates an open space use, or the facility is an integral part of a larger network that is impractical or uneconomical to relocate, such as a road. In such cases, FEMA must also examine the possible effects of not restoring the facility, minimize floodplain/wetland impacts, and determine both that an overriding public need for the facility clearly outweighs the Executive Order requirements to avoid the floodplain/wetland, and that the site is the only practicable alternative. 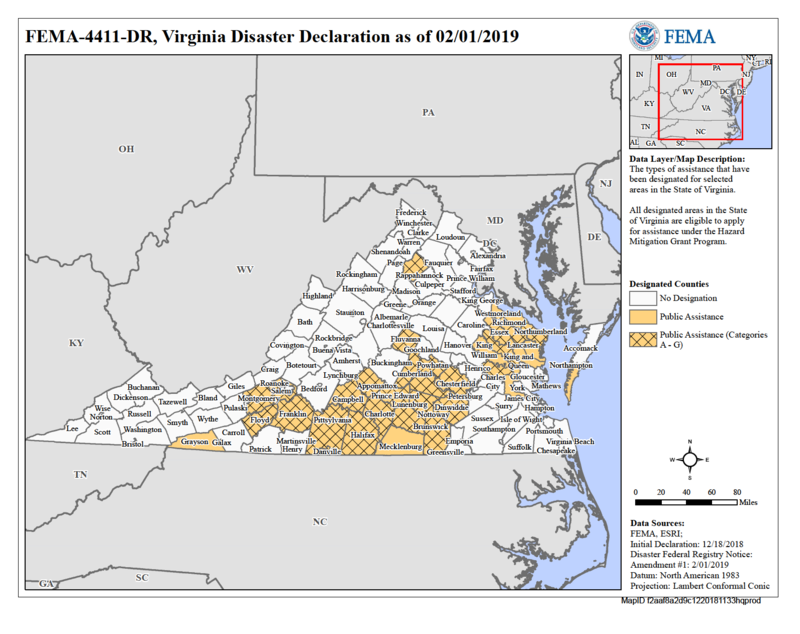 The Commonwealth of Virginia and local officials will confirm to FEMA that proposed actions comply with all applicable State and local floodplain management and wetland protection requirements. FEMA also intends to provide HMGP funding to the Commonwealth of Virginia to mitigate future disaster damages. These projects may include construction of new facilities, modification of existing, undamaged facilities, relocation of facilities out of floodplains, demolition of structures, or other types of projects to mitigate future disaster damages. In the course of developing project proposals, subsequent public notices will be published if necessary, as more specific information becomes available. The National Historic Preservation Act requires federal agencies to take into account the effects of their undertakings on historic properties. Those actions or activities affecting buildings, structures, districts or objects 50 years or older or that affect archeological sites or undisturbed ground will require further review to determine if the property is eligible for listing in the National Register of Historic Places (Register). If the property is determined to be eligible for the Register, and FEMA’s undertaking will adversely affect it, FEMA will provide additional public notices. For historic properties not adversely affected by FEMA’s undertaking, this will be the only public notice. As noted, this may be the only public notice regarding the above-described actions under the PA and HMGP programs. Interested persons may obtain information about these actions or a specific project by writing to the Federal Emergency Management Agency, Joint Field Office, 4461 Cox Rd, Glen Allen, VA. Comments should be (addressed) sent in writing to Donald Keldsen, Federal Coordinating Officer, at the above address within 15 days of the date of this notice.